Jan Dyre Bjerknes has made a terrific breakthrough with his PhD research that I'm very excited about: see the YouTube video (courtesy of Jan Dyre) below. Let me explain what's going on here, and why I'm so excited about it. The swarm of 10 e-puck robots, starting on the left of the arena, are attracted to the beacon (the black box) on the right of the arena. Crucially the swarm's movement toward the beacon is not directly programmed into the robots, it is what we call an emergent property of the swarm. I won't explain how it works here, except to say that the robots need to - in a sense - cooperate. One robot can't make it to the beacon on its own, nor two, nor three or four. Five is about the fewest number that can get to the beacon. If you watch the movie clip carefully you will see that a few seconds into the experiment Jan Dyre has arranged that two of the robots fail: you can see them stop moving. In fact they fail in a really bad way. Their electronics and software still works, only the motors have failed. But because the swarm works cooperatively, the failed robots have the effect of anchoring the swarm and impeding its movement toward the beacon. However, what the clip also shows is that 'force' of the swarm movement (of the 8 robots still working) is, after a while, enough to overcome the 'anchoring force' of the two failed robots. 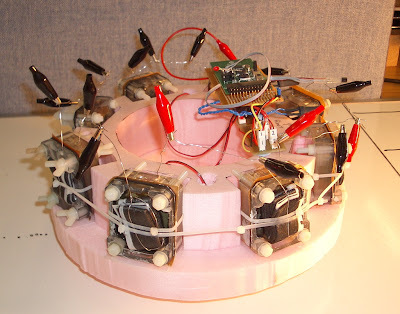 Bearing in mind that partial failures are the worst kind, 20% is a massive failure rate, so this experiment demonstrates the very high level of fault tolerance in a robot swarm. Terrific to have visits today of both Richard Vaughan at his team from Simon Fraser University in Vancouver, Canada, and Marco Dorigo from the Universite Libre de Bruxelles. Both Richard and Marco are luminaries in the field of Swarm Robotics: Richard for his part in developing the Player/Stage simulation tools and Marco for more or less pioneering the field of Swarm Intelligence and subsequent leading swarm robotics projects such as SWARM-BOT. It has been brilliant to see the amazing coverage of the Heart Robot project during the last two days. Check out this piece on BBC news online, or Google Heart Robot. Heart robot was jointly conceived by my colleagues Matthew Studley (lecturer in Robotics), Claire Rocks (research fellow) and BSc robotics student David McGoran. Matt and Claire wrote the bid for funding from the EPSRC partnerships for public engagement scheme, with David as a named researcher. I don't need to describe Heart Robot because you can see the whole story on the excellent project web pages here http://www.heartrobot.org.uk/. The reason for this post is to say Way to go Team, and to anybody out there who might be thinking of studying robotics at university: this is what can happen when you come and do robotics at UWE!. Being interviewed live on national radio is an interesting experience. It's not so bad when you're in a studio face to face with the interviewer. Then there's a proper sense of occasion, of being there for a purpose, something to rise to. But being interviewed by telephone is an altogether different and more risky proposition. Why risky? Let me set the scene. You've agreed to be interviewed by a national radio station that has, hitherto, never blipped onto your cultural radar. The producer called and asked if you would be able to comment, in the science slot of the breakfast show, about a recent newspaper article listing the top 10 reasons that mankind could be wiped out this century. In particular the one that predicts mankind will, within 40 years, build super-intelligent robots who promptly (and ungratefully) enslave their creators. Quickly passing over your observation that said producer seems surprisingly laid back, you say to yourself - can't be so bad - they have a science slot. And of course you would be grateful for the opportunity to explain why this particular prediction is laughably absurd. With 20 minutes to spare you find the radio station on the Interweb and click the listen now button. The presenter starts to talk about robots-taking-over-the-world and invites a phone in. He wants listeners to phone with mad robot inventions and introduce them with a robot voice. Hmmm. At this point you begin to realise that the science slot doesn't have quite the level of gravitas that you might have hoped for. Then the phone rings. Butterflies. Ok, normal. It's the laid back producer again. After a few minutes listening to the radio on the phone you hear yourself being introduced and you're on. This bit is always weird. You're on the phone with a few hundred thousand people on the other end. Just focus. It's only a conversation with some guy. Nevermind that he's called Xane. Or the fact that he just egregiously misquoted the article by inserting the words 'taking-over-the-world' between 'probability of super-intelligent robots' and 'high'. The first couple of questions are kind of ok. More or less what you expected. You carefully explain that no, in your opinion it's extremely unlikely that we will build robots with super-human intelligence in the next 40 years and, even if we did, why should they be evil and take over the world (or more to the point why would we make them evil). Then some relatively innocuous questions: What is the most powerful robot in the world - is it Asimo? Er no, Asimo is actually remotely controlled by a team of 6. What about that freaky monkey robot with the robot arm? Well, that's not so much a robot as work to improve neural electronic interfaces to help people with smart prostheses. Then just when you think it's all over you get the inevitable mad-question-at-the-end. Q. But if robots did take over the world, what would we call them? A. I really don't think robots are going to take over the world. Q. (More insistently this time) Yes, but if they did. What would we call them? A. No, they really aren't going to take over the world. Q. (Even more insistently) But what if they did? What would we call them? Then you make a fool of yourself on the radio by wearily saying 'evil robot master' or somesuch nonsense, thus eliciting the triumphal response from Xane and his co-presenter: Aha! See, the professor says so. Robots really are going to take over the world. 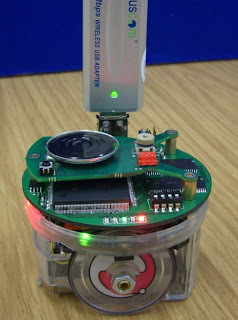 I'm very excited because my colleague Wenguo Liu has completed testing of a Linux plug-in board for the e-puck robot. This board very significantly enhances the e-puck - making it into a fully grown-up Linux robot. Here it is with its USB Wifi stick. Here's a video clip, by Davide Laneri, of one e-puck sounding a tone on its loudspeaker, and the other hearing the tone and turning toward it. In order to make this work we've had to (1) turn the loudspeaker of the e-puck on the right so that it's facing directly forward (like a mouth) and (2) add 'ears' to the e-puck so that it has directional hearing. We've not done extensive tests because we've now decided to focus our effort, here in Bristol, on imitation of movement instead of sound. I just returned from an amazing meeting in Stuttgart with an amazing group of people: the project kick-off meeting for the Symbrion project. So what is Symbrion and what are we trying to achieve? Well, the idea is to build a swarm of mobile robots that can autonomously self-assemble into an artificial organism in which each individual robot becomes - in effect - a cell in a kind of artificial multi-cellular organism. The idea of self-assembling robots is not new, but in Symbrion the robots will be able to function as a swarm but then, if the situation demands, self-assemble into a 3 dimensional organism; then if required disassemble and form into a different kind of 3D organism. Imagine the swarm coming to a barrier too high to cross then autonomously forming an 'organism' to climb over the wall, then disassembling and reassembling into a different morphology to, for instance, collectively transport an object too large for a single robot to carry. In this way the Symbrion organism will be able to morph between different 3D forms as required by the situation. No surprisingly, Symbrion is an extremely challenging project with very tough technical milestones. 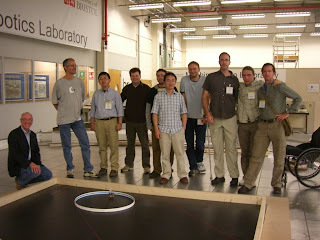 Our first task is to design and build the Symbrion robots - each robot will need to operate autonomously and have its own power, computation, sensing and motors for mobility but - in addition - have the ability to physically dock with other Symbrion robots on several sides. Furthermore the docking mechanism will need to be motorised so that once attached several robots will be able to bend in 3D. Thus a 2D swarm will be able to self-assemble into a 2D planar structure but then, once assembled, lift itself into a 3D shape - for instance from a X shape into a 4 legged walker. Postscript: following the London press launch ITN posted the TV interview onto YouTube, see Robots with a mind of their own. When will people invent robots to fight in wars? Could you create a robot with a mind of its own? Can we invent a robot that will do everything for you? Will the human brain ever be capable of understanding itself? What actually is Intelligence? Do we understand it? Is it possible that AI technology may get out of control? How and Why do we have Culture? In the run up to Science Week (7-16 March) the BA have been asking both the public and scientists for their big questions (see my previous blog What do Aliens look like). When I was asked for my Big Question I didn't have to think too hard, because I'm part of just about the most exciting research project of my life. That project is called The Emergence of Artificial Culture in Robot Societies, and sets out to answer the question "how can culture emerge as a novel property of social animals?" or to put it another way "how and why do we (humans) have culture?". Of course you may be wondering what business a robot guy (me) has to do with a question of - essentially - evolutionary anthropology, which on the face of it has nothing to do with robotics. Well, firstly I've spent the last ten years working on Swarm Robotics - basically building robot swarms to try and understand how swarm intelligence works, and a robot swarm is a kind of primitive society of robots. Secondly, that work has opened my eyes to the extraordinary power of emergence, or self-organisation*. And thirdly, I'm passionate about trying to work on research problems that completely cross discipline boundaries, ideally across the arts/humanities, social- and natural-science boundaries. The question "how and why do we have culture" is just such a question. I won't explain now how we intend to address this research question in detail. Suffice it to say that we are going to use a radical approach - which is to build a society of real robots, program them with (what we believe to be) a necessary and sufficient set of social behaviours, then observe them free running. Of course the big question then is will anything happen at all that is capable of being robustly interpreted as evidence of emerging proto-cultural behaviours and - if it does - would we even recognise it (since this will be an emerging robot- not human- culture; an exo-culture if you will). I'm privileged to be part of a team that includes a computer scientist, theoretical biologist, philosopher, social scientist and art historian/cultural theorist. For more detail here is the announcement on EPSRC grants on the web. Not least in order to mitigate the risk that we fail to recognise anything interesting that might emerge, but also because we strongly believe in Open Science, the whole project will be on the web - live robots, data and all - as soon as we're up and running. 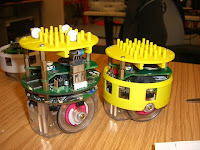 And here's a picture of 2 of the robots we plan to use (called e-pucks). We've added some 'ears' so that they can chirp at each other; the artificial culture lab will have around 50-60 of these robots. 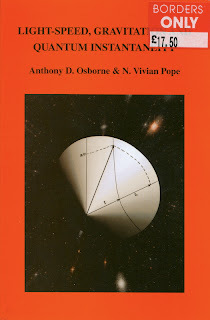 *Emergence is - in my view - both ubiquitious (everywhere from physics, to life, intelligence and culture, to galaxies) and for more important than I think we realise. I would go so far as to say that I believe natural selection (although beautiful and powerful) is on its own insufficent to explain the astonishing complexity of many biological and societal systems. I think you need natural selection + emergence. Amazing meeting yesterday afternoon at the Science Museum. Here's the story: the British Association for the Advancement of Science (BA) has been asking for science questions via their web pages for awhile, in advance of Science Week, which is 7-16 March. A question that keeps coming up is "what do aliens look like?" so, to address that question, the BA pulled together a small panel which met yesterday. Our brief was to come up with some plausible alien life forms that can be visually presented during Science Week. The keyword here is plausible. It would be easy to pluck super-exotic aliens from the rich fauna of SF but then very difficult to explain the science. Of course, the fictional evolutionary science, or biochemistry, or ecosystems of even plausible aliens is going to have gaping holes, but we were tasked with trying to minimise those. So, what did we come up with..? 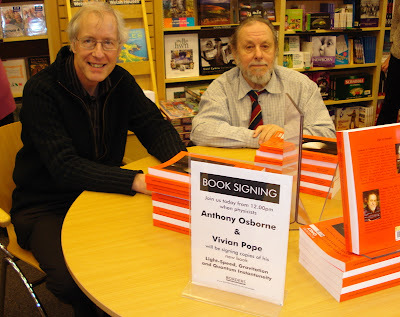 I can't say now but all will, I hope, be revealed during Science Week (and in this blog, then). ...and here is the press release describing our life forms. 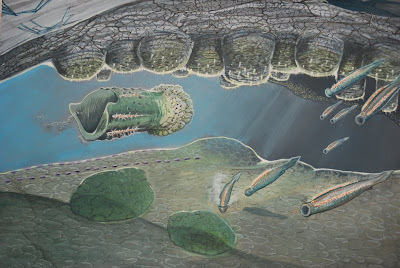 Visualisation by Julian Hume, Research Fellow at the Natural History Museum/University of Portsmouth. Here at @Bristol Walking with Robots is running a 3-day workshop for students and researchers in robotics, artificial intelligence and animatronics. It's a kind of masterclass whose objective is to train those students and researchers in science communication, with the hope that they'll be motivated to get involved in public engagement. I'm not going to talk about the training workshop here because it's described elsewhere in both a recent UWE press release Making Science Fun for Everyone and on EPSRC grants on the web here. What I want to blog about here are the robot bloggers on wwrobots.wordpress.com. 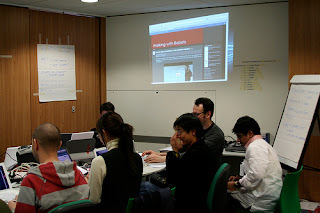 The workshop has four streams with about a quarter of the students signing up for each. One of those streams is New Media, which is training its group in online reporting. Here is picture of the online newsroom. These students have been tasked with publishing stories from the other three groups. Remarkably, the blog was up and running by mid-morning Monday and has provided a more-or-less real-time record of the workshop since then. The newsroom has been busy the whole time, but never more so than right now. This afternoon the whole workshop has had an amazing opportunity to put their activities to the test on the floor of @Bristol, and since this is the half-term holidays it's pretty busy out there (to put it mildly). Our robot bloggers have been out on the floor too, recording with still photos, video and text, the extraordinary excitement of the interaction between our students, their robotics, AI and animatronics activities, and the children and families. Scroll down wwrobots and you'll quickly get a sense of that excitement. Of course I'm focussing on just one aspect of the workshop but it was, for me, perhaps the most surprising. Firstly, by opening my eyes to the potential for Web 2.0 media to provide - in effect - real time interactive reporting; a kind of worldwide outside broadcast. It seems to me that, with this approach, there is remarkable potential to enhance and extend the reach of many kinds of public engagement or science communication. But secondly and even more significantly here, our robot bloggers bound together the whole workshop in an altogether unexpected and enriching way.